Sterling silver, 18 kt yellow, green & rose gold. 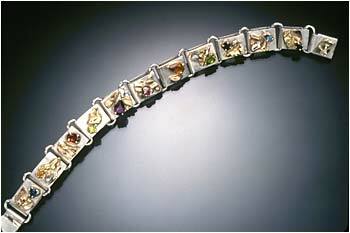 Multiple gemstones: blue topaz, amethyst, citrine, garnet, peridot, sapphire. All content on this Web Site site is the property of Cindy Mulhollen and is protected under United States and International copyright laws. The images may not be reproduced, stored, or manipulated without the written permission of the artist.